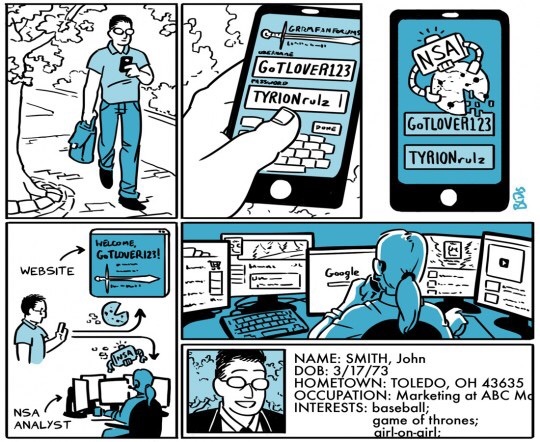 One of the National Security Agencyfs most powerful tools of mass surveillance makes tracking someonefs Internet usage as easy as entering an email address, and provides no built-in technology to prevent abuse. 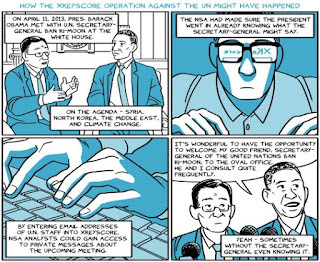 Today, The Intercept is publishing 48 top-secret and other classified documents about XKEYSCORE dated up to 2013, which shed new light on the breadth, depth and functionality of this critical spy system \ one of the largest releases yet of documents provided by NSA whistleblower Edward Snowden. 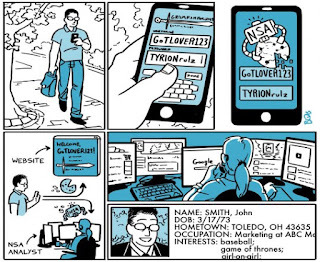 The NSAfs XKEYSCORE program, first revealed by The Guardian, sweeps up countless peoplefs Internet searches, emails, documents, usernames and passwords, and other private communications. 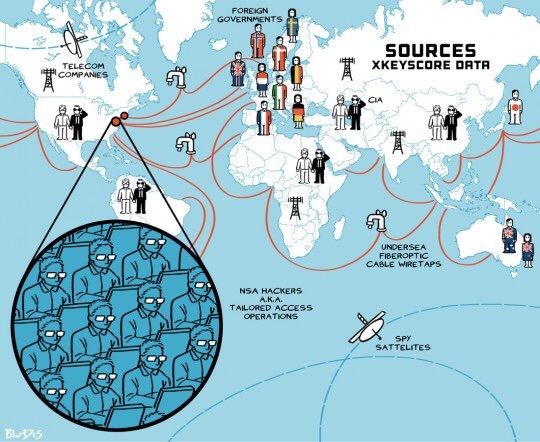 XKEYSCORE is fed a constant flow of Internet traffic from fiber optic cables that make up the backbone of the worldfs communication network, among other sources, for processing. As of 2008, the surveillance system boasted approximately 150 field sites in the United States, Mexico, Brazil, United Kingdom, Spain, Russia, Nigeria, Somalia, Pakistan, Japan, Australia, as well as many other countries, consisting of over 700 servers. XKEYSCORE also collects and processes Internet traffic from Americans, though NSA analysts are taught to avoid querying the system in ways that might result in spying on U.S. data. Experts and privacy activists, however, have long doubted that such exclusions are effective in preventing large amounts of American data from being swept up. One document The Intercept is publishing today suggests that FISA warrants have authorized gfull-takeh collection of traffic from at least some U.S. web forums. The system is not limited to collecting web traffic. The 2013 document, gVoIP Configuration and Forwarding Read Me,h details how to forward VoIP data from XKEYSCORE into NUCLEON, NSAfs repository for voice intercepts, facsimile, video and gpre-released transcription.h At the time, it supported more than 8,000 users globally and was made up of 75 servers absorbing 700,000 voice, fax, video and tag files per day. The reach and potency of XKEYSCORE as a surveillance instrument is astonishing. The Guardianreport noted that NSA itself refers to the program as its gwidest reachingh system. In February of this year, The Intercept reported that NSA and GCHQ hacked into the internal network of Gemalto, the worldfs largest provider of cell phone SIM cards, in order to steal millions of encryption keys used to protect the privacy of cell phone communication. XKEYSCORE played a vital role in the spiesf hacking by providing government hackers access to the email accounts of Gemalto employees. 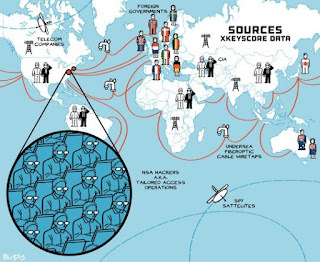 XKEYSCORE allows for incredibly broad surveillance of people based on perceived patterns of suspicious behavior. It is possible, for instance, to query the system to show the activities of people based on their location, nationality and websites visited. For instance, one slide displays the search ggermansinpakistn,h showing an analyst querying XKEYSCORE for all individuals in Pakistan visiting specific German language message boards. The NSAfs ability to piggyback off of private companiesf tracking of their own users is a vital instrument that allows the agency to trace the data it collects to individual users. It makes no difference if visitors switch to public Wi-Fi networks or connect to VPNs to change their IP addresses: the tracking cookie will follow them around as long as they are using the same web browser and fail to clear their cookies. XKEYSCORE has, however, also been used to spy on non-terrorist targets. 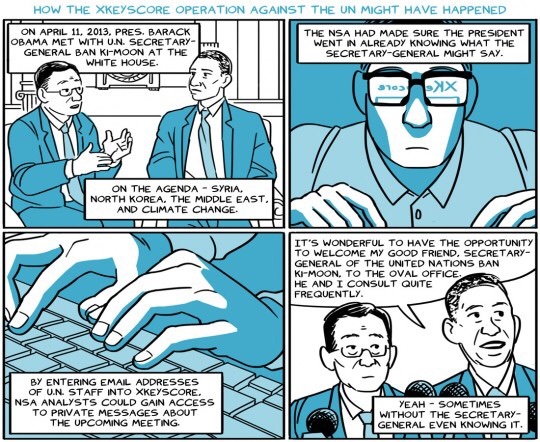 The April 18, 2013 issue of the internal NSA publication Special Source Operations Weekly boasts that analysts were successful in using XKEYSCORE to obtain U.N. Secretary General Ban Ki-moonfs talking points prior to a meeting with President Obama. XKEYSCORE plays a central role in how the U.S. government and its surveillance allies hack computer networks around the world. One top-secret 2009 NSA document describes how the system is used by the NSA to gather information for the Office of Tailored Access Operations, an NSA division responsible for Computer Network Exploitation (CNE) \ i.e., targeted hacking. Particularly in 2009, the hacking tactics enabled by XKEYSCORE would have yielded significant returns as use of encryption was less widespread than today. Jonathan Brossard, a security researcher and the CEO of Toucan Systems, told The Intercept: gAnyone could be trained to do this in less than one day: they simply enter the name of the server they want to hack into XKEYSCORE, type enter, and are presented login and password pairs to connect to this machine. Done. Finito.h Previous reporting by The Intercept revealed that systems administrators are a popular target of the NSA. gWho better to target than the person that already has the ekeys to the kingdom?fh read a 2012 post on an internal NSA discussion board. The same methods are used to steal the credentials \ user names and passwords \ of individual users of message boards. Indeed, training documents for XKEYSCORE repeatedly highlight how user-friendly the program is: with just a few clicks, any analyst with access to it can conduct sweeping searches simply by entering a personfs email address, telephone number, name or other identifying data. There is no indication in the documents reviewed that prior approval is needed for specific searches. In addition to login credentials and other target intelligence, XKEYSCORE collects router configuration information, which it shares with Tailored Access Operations. The office is able to exploit routers and then feed the traffic traveling through those routers into their collection infrastructure. This allows the NSA to spy on traffic from otherwise out-of-reach networks. XKEYSCORE documents reference router configurations, and a document previously published by Der Spiegel shows that gactive implantsh can be used to gcop[y] traffic and direc[t]h it past a passive collector. Once the hacking tools and techniques of a foreign entity (for instance, South Korea) are identified, analysts can then extract the countryfs espionage targets from XKEYSCORE, and gather information that the foreign power has managed to steal. Monitoring of foreign state hackers could allow the NSA to gather techniques and tools used by foreign actors, including knowledge of zero-day exploits\software bugs that allow attackers to hack into systems, and that not even the software vendor knows about\and implants. Additionally, by monitoring vulnerability reports sent to vendors such as Kaspersky, the agency could learn when exploits they were actively using need to be retired because theyfve been discovered by a third party. By the nature of how it sweeps up information, XKEYSCORE gathers communications of Americans, despite the Fourth Amendment protection against gunreasonable search and seizureh \ including searching data without a warrant. The NSA says it does not target U.S. citizensf communications without a warrant, but acknowledges that it gincidentallyh collects and reads some of it without one, minimizing the information that is retained or shared. If, for instance, an analyst searched XKEYSCORE for all iPhone users, this query would violate USSID 18 due to the inevitable American iPhone users that would be grabbed without a warrant, as the NSAfs own training materials make clear. Screenshots of the XKEYSCORE web-based user interface included in slides show that analysts see a prominent warning message: gThis system is audited for USSID 18 and Human Rights Act compliance.h When analysts log in to the system, they see a more detailed message warning that gan audit trail has been established and will be searchedh in response to HRA complaints, and as part of the USSID 18 and USSID 9 audit process.